Learn the advantages of selecting the right operating styles to fit your space. On first floors, you may have security concerns. To keep your home more secure, but still enable easy ventilation, you might consider combinations of picture and awning or casement windows. These windows are harder to pry open when locked. To bring in more light and air, consider combos of awning windows above or below a picture window. For a kitchen window over a sink or counter, a single-hand operation window, such as casement or awning, lets in lots of light and is easy to open when reaching over. 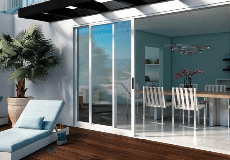 Patio doors come in three operating styles: in-swing, out-swing and sliding. A simple and important step in choosing the right door is measuring the amount of space on both the interior and exterior of the entrance. Some double hung window models have tilt-in sashes for easy cleaning. In second- and third-story rooms, these windows save you from having to haul out a ladder to clean your windows. In a child's bedroom, opening only the top sash of a double hung window for ventilation can add an extra measure of safety. There are a multitude of privacy/obscure glass options that protects privacy while letting in light without the need for window treatments. Transom windows and skylights provide ambient light without compromising privacy. In the bathroom, you may want to consider at least one operable window to vent moisture without relying solely on a fan. If you have walkways or paths near your windows, you may want to consider operating styles that will not open out such as horizontal sliders, single hung and double hung windows.